The intranets! Let them in! Let them play! Can you help me too? Thanks for visiting my blog. I hope you find it useful. 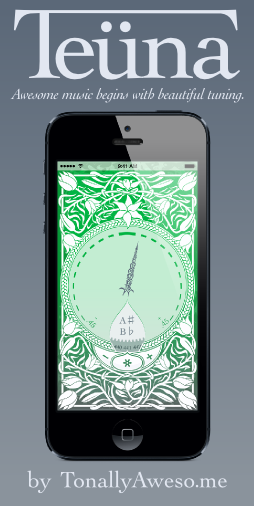 If you have benefitted from something here, please consider helping me spread the word about my first iOS app, Teüna. It’s a chromatic tuner for any instrument or voice and it runs on iPhone, iPad and iPod Touch. I've taken special care to make it elegant, fast, and accurate, and I think it's honestly the best tuner on the App Store for everyday use. If you could take a minute to mention Teüna to any musician, student, teacher or parent you know who might like it, I'd really appreciate it. If you're feeling really generous, App Store reviews are the best way to thank me!